Sandow Birk is a real renaissance man. His exceptional, provocative and socially conscious work has garnered a small but passionate following from the Juxtapoz set, as well as the international art community. Formally trained, Fulbrighted and Guggenheimed, Sandow brings Old-Master talent and an amazing sensibility to all that he does. In my surf industry days, I was luck enough to meet Sandow, through local Sunset beach surfer, and art patron, Greg Escalante. Working across all mediums, both public and private, Sandow is a painter, sculptor, muralist, puppeteer, and filmmaker. He is a respected muralist, creating pieces for L.A. County lifeguards, public transportation, and the City of Long Beach. His best known work is his most ironic: “Prisonation,” plein air-like landscapes of California’s state prisons, and “In Smog and Thunder,” oils depicting a contemporary civil war between San Francisco and Los Angeles. I’m awed by the scope of his creativity and multi-media talent—but naturally, I’m particularly fond of Sandow’s surf pieces. These aren’t the lyrical watercolors of John Severson or Pettibon’s punk aesthetic. Sandow’s surf series take a look at important world events—all from the surfer’s point of view. Connecting surfing to the maritime world, writ large, Sandow believes the surfer’s a kin of sailors: both watch tides, chart storms and share an intimate knowledge of their home ports. Up until 10 years ago, my taste in surf art was kitsch, garage sale, or an oversized one-sheet from a 60’s Hollywood surf film. 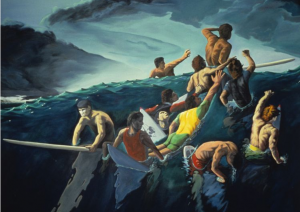 As part of an overall committment to surf art, I saw Sandow’s surf pieces at the Laguna Art Museum, and was inspired by his surfer’s view of history. I was particularly taken by a massive 8’X8’ oil, “The Release of Nelson Mandela from Robben Island Prison, Cape Town, South Africa-March 12, 1989.” Sandow’s painting depicts the historic release of the South African who was to lead his country and become president. As the boat leaves Robben Island, site of one of South Africa’s most notorious prisons, surfers in the foreground ride perfect right handers, oblivious to the internationally newsworthy event nearby. For two years, the painting hung on loan in front of my office door. I studied it daily, and through some passionate pleading and horsetrading, I acquired Sandow’s “The Release of Nelson Mandela…” four years ago. Its massive scale and social commentary make an interesting juxtaposition between my “found” surf art and Pettibons. I want to let you know that I’ve enjoyed reading your blog. Since it’s one of a handful of my must-reads, I’ve gone ahead and added it to my blog’s list of favorites. Looking forward to more of your great postings.